As with the last post, this album was originally posted by Allywonderland for the Halloween Countdown of '08. Some of the links on the Sharebee page were down so I went ahead and reuploaded the album to Mediafire. I figure its about time for me to move on to other areas of the horror genre, so this is going to be my last Italian horror themed post for the time being. I may or may not post one or two more before the countdown ends, depending on whether or not I finish posting all of the material I had originally planned to post. I hope you all have enjoyed the selections I have presented up to this point, as well as those that I will be posting in the near future. 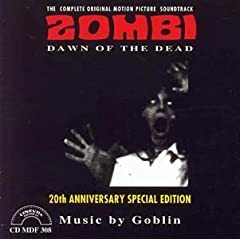 I was pleased to know that a few of you enjoyed Goblin's Suspiria soundtrack; therefore I am going to post the Zombi (Dawn of the Dead) Original Soundtrack. Originally released in 1978, the Goblin soundtrack was featured prominently in Dario Argento's international cut of Dawn of the Dead. Argento, himself, is also credited on the Goblin soundtrack. However, in George A. Romero's version, the Goblin soundtrack was used sparingly and mixed with stock music scores. I am posting the reissue of the 1978 release which includes the ten original tracks with seven bonus tracks. Thanks a HELL of a lot for all the great Halloween material you have been posting. I have really enjoyed stopping by each day and seeing what new treasure you have unearthed, and the Zombi soundtrack by Goblin is the icing on the Samhain cake! Nice to connect with folks who have the same interests. Great blog! thanks for this awesome piece of italian horror prog !! @Harry Lime: You're more than welcome my friend. Thank you for taking the time to comment. Take care.